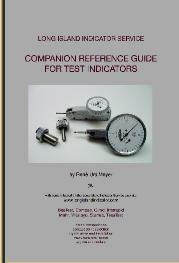 High Quality Swiss test indicators with metric attachments. 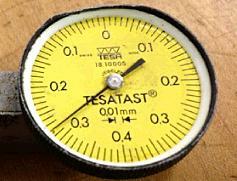 For all intents and purposes, the Swiss-made Tesatast indicator is identical to Bestest, Swisstast, and Roctest. All parts are interchangeable, including contact points. What is the difference between Tesatast and BesTest? They are both made by the same manufacturer (TESA) and only the dials and certain accessories differ. Most significantly, Tesatast indicators come with a metric 8mm diameter dovetail extension attachment, while Bestest is supplied with 1/4" diameter extensions. You will also find Tesatast has several configurations, particularly those with long contact points (1.5"), which are not available in the Bestest models. Conversely, if you don't find the configuration you need here, be sure to look at the Bestest models. Other accessories and contact points are available. For a more detailed comparison of brand names go to page 37. All parts are available and repairs can effectively be made on any of these indicators. Our fixed repair cost for these and other indicators is posted on page 30. This includes labor and all parts except a new carbide contact point. It's our policy to replace any damaged or worn parts necessary for the full function of the indicator. This way you'll be sure to get an instrument that's as good as new and one you can rely on. And, if requested, we'll provide you with a short-form certificate of calibration free with every indicator repair. After all, when your instrument comes back, you need to know that it's accurate. The Long Island Indicator TesaTast Repair Manual is available on page 177. Supplied with 8mm diameter dovetail extension and case. It's a deal. Send us a purchase order and pay the purchase order price shown below. Click on "check price and stock" and pay the discounted Internet price instead. You may order online by selecting any linked model number shown. Certificate of Accuracy provided without test data. The certificate guarantees the accuracy as shown above. If you need a full certificate, NIST traceable, be sure to specify when ordering. There is an additional charge. These light weight Swiss made vertical test indicators are supplied with one 8 mm dovetail stem attachment, contact point wrench and a case. They make one revolution and the specifications are the same as the horizontal models shown above. Other stem and dovetail attachments are available on page 36. Ruby, Nylon and Teflon contact points are available in different sizes on page 21. Certificate of Accuracy provided without test data. The certificate guarantees the accuracy as shown above. If you need a full certificate, NIST traceable, you will need to send the indicators to an accredited calibration laboratory. For a selection of labs, refer to page 76. Parallel style Tesatast models have dials mounted on the side of the body. There are 3 separate dovetails along the edges of the body as shown in the photo below. They are supplied with an 8mm diameter dovetail extension. Refer to accessories if you need different size holders. These come standard with .080" diameter carbide ball contact points. Other sizes and types are available on page 21. By clicking "check price" you will find some excellent discounts from 15% to 20% and more in some cases. Go ahead and place your order through Amazon if it looks good to you. Metric indicators shown in yellow will have yellow dials. Manufacturer's short form Certificate of Accuracy provided without test data. The certificate guarantees the accuracy as shown above. If you need a full certificate, NIST traceable, you will have to send the indicator to an accredited calibration lab. For a listing of laboratories, refer to page 76. Q: Could I order a new crystal for this indicator? I know that it looks beat-up, but still works fine. If a new or used bezel is also available and not too expensive, please also tell me how much that would be? A: It will not be possible to install a new crystal in a bezel which is no longer perfectly round. Replacing the bezel is not easy. Unfortunately it is time to send it to a repair shop. Q: The machinist who is requesting this Tesatast indicator was wondering if there was any was to make it more oil resistant. That seems to be the main issue with many of our indicators and due to the cost of this indicator it would help extend its life. A: None of the test indicators are immune to oil or liquid contamination. Although not as much of a problem if the oil sprays from above, it can quite obviously enter the body near the contact point. Some people have experimented with plexiglass shields. Perhaps this is something you can look into. Q: I have a side mounted dial Tesatast indicator (18.10011) and one of the screws securing the dial is loose. Consequently the dial is not moving freely if not completely centered. Are you able to advise as to how I can remove the crystal and dial to secure the screw? I feel shipping to the US from Australia will make this an expensive repair for a minor issue. Can I take it to a watchmaker? For answers to this and other test indicator questions, please take a look at some of our new publications (see below).